I have never been all that organized, especially with my writing. Recently I have been looking through my old notebooks, the insides of which are scrawled top to bottom in a nearly illegible brick of sloppy script. For the most part, I just worked through it. I felt that the end manuscript mattered so much more than the notes, and that a system was unnecessary. Then I found Evernote. For those of you that have been avoiding cloud computing for a while, it is a comprehensive note-taking program that can sync with your computer and phone. I use a Mac at work, a windows computer at home, and an Android phone, all of which sync perfectly. For someone like me, who carries his phone to the ends of the earth (I went hiking around 12,000 feet with it not terribly long ago), it is beyond convenient to be able to create notes with such ease. The interface is simple to the point of idiot proof, and can be learned in a few minutes. 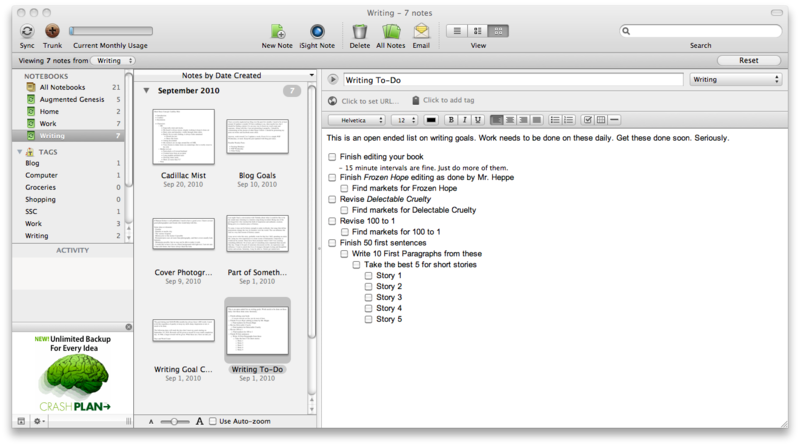 As I have stated in a few articles before, I am trying to do a better job of outlining. I want my next novel to be more concise, and to have a clearer idea of where it is going. Trying to trim a 105,000-word novel down to 80,000 isn’t an easy task, and hopefully this will save me some work. 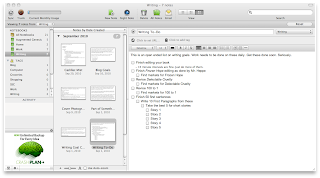 My outlines currently exist entirely in Evernote. I still carry paper notebooks with me at all times, but at the end of each day, I try to transfer my notes into Evernote. It helps to clarify and reinforce the ideas I had, as well as dismiss the half-witted concepts that somehow find their way to my writing. Either way, I would recommend it to writers, and anyone else who has to do a lot of note taking. My job requires most people to leave a path of sticky notes everywhere they go, and I was able to eliminate that. Not to sound like a shill, but I am now an avid user of this software.